Editor’s note: This post was originally published on September 4, 2008. It was substantially revised and reposted on April 28, 2014. Susan is your aunt, but this vintage possibility would sound right at home in 2014. Thanks to Kim for suggesting today’s Name of the Day: Susannah. Susannah goes all the way back to the Old Testament, but she’s a nature name with botanical roots. 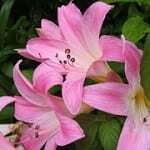 In Hebrew, shoshan is lily. In Persian, the flower was called sausan. Both may relate to an Ancient Egyptian botanical name, but then again, maybe not. She’s evolved quite a bit. The Hebrew original is closer to Shoshannah, while the Greek is more like Sousana. In English, she’s often Susanna, but the ‘h’ spelling feels quite appealing, too, maybe because of the recent popularity of Hannah. Back to the original Biblical bearer of the name. Susannah was a virtuous woman. A pair of Peeping Toms spy on her in the bath, and come demanding favors or else they’ll sully her good name. She tells the Toms no dice, and is willing to face death – these were the days when a bad reputation was truly dangerous. Just as things look bleak, enter Daniel. (It’s his book of the Bible in which the story appears.) Daniel performs a cross examination worthy of a modern courtroom drama, and the Toms’ tale collapses. They’re put to death for lying, and Susannah – her virtue intact – goes free. While some parts of Daniel were stricken during the Protestant Reformation, her story was well enough known to keep the name in occasional use through the Middle Ages. There’s also Stephen Foster’s 1848 hit Oh! Susanna, popularly associated with the California Gold Rush, which started right as the song took off. A third century virgin martyr from the Diocletian persecutions, making this a saint’s name. William Shakespeare, that great namer, had a daughter called Susanna. During the Salem witch trials, Susannah was the name of both an accuser and one of the victims. Shirley Temple wore the name in a big screen adaptation of Muriel Denison’s novel about a young girl in the West. In the novel, she’s visiting her uncle, a Canadian Mountie. In the movie, she’s orphaned after an Indian attack and taken in by a Mountie – who Susannah eventually saves right back. Despite the folk ballad, the movie, and the Biblical references, Susanna and Susannah have not been smash hits in recent centuries. Instead, Susan has dominated the popularity charts, ranking in the Top Ten from 1945 to 1968. The French Suzanne placed in the Top 100 most of the 1940s, 50s and 60s. Susanna left the rankings entirely in 1997. Susannah has been gone since 1979! Or go with the approach taken by the parents of so many little girls who are Alexandra, not Lexi, thanks, and call her Susannah. If you’re looking for a familiar, but seldom heard name that has deep roots, a mix of femininity and strength, then Susannah – with or without the ‘h’ – is absolutely one to consider. 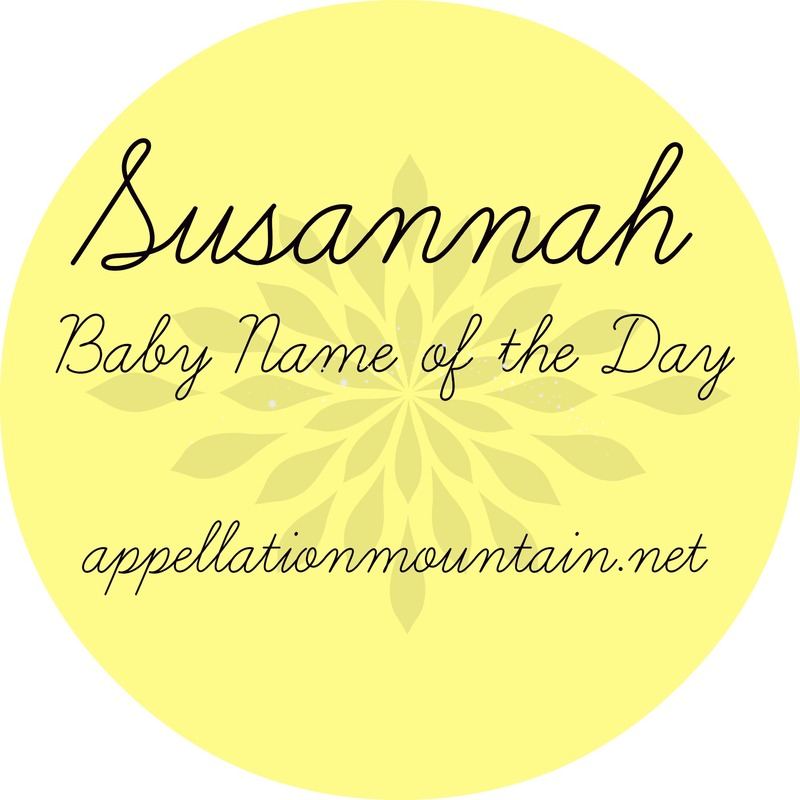 I am a Susannah and I have always loved the name! I almost never hear anyone with it and it is beautiful but everyone knows how to say it. I do have to spell it all the time when doing stuff like that but honestly, what name don’t you have to spell anymore? I have always been the whole Susannah but am thinking based on these comments about introducing the Suki nickname into my world…. All the kids at daycare call my two-year old Susanna “Nana,” and she’s been calling herself that too. One of my colleagues gave his daughter the middle name Susanna, so maybe it’ll come back to the charts one of these years. I love Susannah, and I’m surprised it isn’t used more often. The only problem I have with Susannah is that on any given day, I might pronounce it differently– some days it’s a long ‘a,’ some days it’s a short ‘a.’ And if I can’t keep the pronunciation straight, how would I expect others to? What do you think of Sosie as a nickname for Susanna? I enjoyed reading the post and comments about Susanna/Susannah. I have a little Susanna, and I agree with many of the previous comments that it is a beautiful, recognizable, under-used, timeless and ageless name (but, I am a bit biased!). I think it makes a wonderful alternative to Isabella or Sophia – similar in style, with equally cute NNs if you choose to use them (our Susanna is occasionally Susie or Susie-Q). I have never been asked if there is an H on the end, but people frequently ask if it Susanna or Suzanna, and some of my older relatives tend to say “Suzanne”, which makes sense as Suzanne was quite popular in their day. What is the history behind the Suzanna spelling, do you know? I love Susanna minus the h, but I love even more because of that z. Yet i’m really a stickler for traditional spellings. My mom’s name is Hannelore Susannah (German name). I like “Hannah” but it’s soooo popular. In a baby name book I saw a comment suggesting that if you like Hannah you might also like Susannah and a seed was planted. I initially was thinking Zannah for a nickname, then fell in love with Suki. We named our little girl Suzannah (German pronounciation, which is why I added the “h” to the end, but people still flatten the vowels which drives me nuts). We call her Suki, Sukini, Su-kiwi, Kookie Suki, Suki monster, Sukilicious, Sukilotta, Sook-a-look… the list is endless. The name suits her. She’s bright, shiny, smiley, and a firecracker. I was just saying tonight that she’s so joyful and her ASL name is the sign for happy. I was delighted to read that it could mean “Joyful.” And she’s part Persian so the name is perfect on multiple levels. Oh, I love Suzannah, nn Suki. As for vowels and pronunciations? We’re all up against regional accents, far more powerful than any spelling can overcome. I’m fascinated by ASL names. I wonder – do you introduce yourself with your full name, or with the short form? I’m sixteen, and my name is Suzannah, but all my friends and family call me Suzie. I’ve never been called anything else, and find it quite cool to hear of all these nicknames. I really like my name, but another one of my favourite girls’ names is Fuchsia. We have a two-year-old Susannah Elizabeth (and it was the only variation of the name we loved) and while we’re generally not nick-name-y around here, if we end up using any diminutive it will probably be Zannah. Our Susannah is a very spunky, firecracker kid – she’ll never be a Sue or a Suzy, but Zan or Zannah seems to fit. I’m now expecting her little sister, and was so glad to find Appelation Mountain — DH and I are feeling much more *stuck* with names for the third child (our oldest is Jonas Patrick). I love your NoTDs – thanks for posting this wonderful resource! 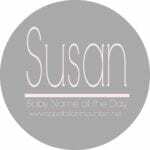 I’m a Susannah (family name) and I love it! I went by Susannah in school and now in professional situations, but it nicknames so easily almost every group of friends had a nickname for me which I find quite fun. The nickname that felt the most me and became almost all I was known by in college was Zanna. I was also Sanna a bit as a baby. My dad called me Susannie as a little kid, occasionally shortened to Annie. My mom calls me Sus, pronounced like Dr. Suess (my mom spoke a little german – its the german word for sweet). I’ve been Suz, of course, and briefly Susie which I totally HATED. I also had a fun teacher in high school who called me Oh which was funny and stuck for a bit. But I do get really sick of hearing that song! I love having a unique name, but one that everyone can pronounce as soon as they see it (sometimes the A becomes an ahh instead, like most European languages do, but I don’t mind). Spelling is a bit of a bother, since there are a lot of variations. I love Susanna! It’s currently my #2 choice for a daughter. It replaced Lily when I realized Lily was getting far too common. I knew a girl in her early twenties named Susannah who went by Zannah — I much prefer it to Suzie, and with Hannah’s popularity, it’s sounds very fresh and modern. Thanks for covering this one! I was shocked when I discovered neither Susanna nor Susannah were in the top 1000, but that’s such a strong argument for using it — it’s so familiar, yet so uncommon. Susana (the Spanish spelling) just barely squeaks into the top 1000, coming in at slot #993. Apparently the name is more often heard among members of the Spanish speaking community. Corinne, I’m always looking for NotD ideas! I don’t have a decent system for taking requests or posting an upcoming calendar to the site … both are on my to-do list! So just feel free to shout them out in a comment – any comment! – and I’ll incorporate them as I can. Lola, here’s wishing you a fabulously named grandchild someday! 🙂 BTW, your Leo is on the list for 10/20 and Josephine for 10/11. Kim, I’m sure you could pull the Anne/Anna out of Susannah! Of course, there’s also Sanna, which I disliked when I first heard, until I realized it tracked back to this lovely name. And Katharine, you’re right – Susannah doesn’t age. Another, I’m sure this one feels common because it’s in pop culture – Oh! Susanna and so on. Plus *all* those Susans, Suzannes and so on. Dana, what a heartbreaking story! But it does give the name more of that pioneer, can-do spirit. I like Susannah too. Interestingly, only Susannah. Not Susanna, Susanah, Susan or Suzanne. Susanna is my favourite of all the Susan variations, it looks fresh and to borrow Lola’s adjective: sprightly. The H in Susannah is one step too far for me and I’m not remotely into any other variations on the theme, neither Suzanne/a nor the dated, frumpy sounding Susan (a lot of my school teachers were Sue’s). On Susanna’s side is her lack of age – like Vanessa, Helena and Miranda – she defies age and sounds at once classical yet fresh. For me, her main drawback is the potential nicknames Suzie and Sukie – which just reminds me of the nursery rhyme where ”Sukie puts the kettle on’! I like Susannah, but more for personal reasons than a passionate love of the name itself. My mother’s name is Susan and my middle name is (or was before I got married and replaced it with my maiden name) Suzanne. I thought Susannah would make a lovely heirloom to pass on someday. Do you think it’d be possibly to pull the “anne/anna” syllable out of Susannah as a nickname? My grand daughter’s name is Susanna. Before she could say it, she called herself Anna. Now it’s a pet name for her from her mother. I think it’s totally usable. I personally adore Susannah, and hope to use it to honour my aunt, Suzanne. All of my aunts have French names (despite the fact that they’re 100% Italian) — Suzanne, Claudette, Denise, & Genevieve. Regarding the name Susannah nn Zuzu, I think it’s the cutest thing in the world! I’m not sure how much Zuzu works for an older woman, but I personally think it’s not mature enough. If I were a Susannah, I’d go by Zuzu until high school, but once college comes I’d be the total Susannah. I first fell in love with the name Susanna as a child reading “Susanna of the Alamo.” (I’m from Texas, so if you’ve never heard of it, don’t feel bad). Susanna Dickinson and her infant daughter Angelina Elizabeth (another name I love!) were the only two Texan survivors of the 13-day attack on the Alamo by Mexican troops. Their story is heartbreaking, but the name sounds strong yet feminine, and has a pioneer-style to my ear. Well, I’m partial to Susanne, as I spell it (as did my mother’s best friend, whose name I got). The “Z” looks funny there, to my eye. *shug* I’m odd, I know. Susanna/h is lovely and miles better than simple (but dated) Susan. I prefer Susanna, as she looks crisper, cleaner and less clunky. That final ‘h’ ruins things a lot for me, I prefer ‘h’ in a name up front (Philippa, Henrietta) or in the middle (Josephine, Mathilda) but at the end, she trips me up visually. All that asde, I do like Susanna/h, she’s spritely, fresh & sweet. I like Sukie as a nickname (Witches of Eastwick, Michelle Pheiffer plays Sukie Ridgemont) and that’s where I learned to like it. Zuzu as always remains my favorite of her nicknames though, not because of “It’s a Wonderful Life (Although Clarence, George & Zuzu are all on my list, I swear, I hate that movie!) 😀 But I also like Zsa Zsa & Zsu Zsu, they fit my maternal line very well. I’d at least think of Zsu Zsu/Zuzu for when she’s little (much like I did with Fifi for Josephine). I was thinking about possibly using Susanna/h to honor my MIL (whose real full name is Pandora Saskia surname. I Love Saskia but it clashes not only with the surname, but also with Josephine, and since my MIL also goes by Sue (I don’t understand but *shrug” it’s her choice). But Susanna/h doesn’t appeal enough to me for actual use. When I try to play around with combos for Susanna/h, I wear out, drift off & forget about her, so I’ve put her on the “Potential List for Grandkids” I have going. (My boys are namenerds themselves and Josie shows signs .. her latest teddy? Cornelius [I think because she overheard Cornelius while listening to “The Fifth Element” which plays about once every other week at my house. I love that film!]) And I keep a list of family related names for them as well as names that have appealed to me over time but ddn’t use for whatever reason. I hope it’ll actually get used! I’d love to see someone else use Susanna/h, she’s a fantastic name! I love it, I love it, I love it. It has long been a favorite of mine – and I’m surprised to see that it’s not on the SSA list at all anymore, with or without the H. I thought it was more common, but I guess I was wrong. I also kind of like Suzanne, but given my distaste for Zs in names, I probably wouldn’t go that route. Sukie is a great nickname, but seems a little dated – the only Sukies I know are 40 and 60 years old!